A short exchange between Martin and Skinnyman, about the rapper’s involvement in the Love Music Hate Racism campaign and his attitudes towards those it opposes. Leeds-born rapper Skinnyman is the latest music icon to join the fight against racism. He is one of the stars supporting this year’s nationwide Love Music Hate Racism (LMHR) campaign. “Racism shows a very shallow level of ignorance. It’s something I don’t entertain,â€? says Alexander Holland — better known as Skinnyman and one of the UK’s most prolific rap artists. Born in Chapeltown, he is 30 years old and highly regarded as a pioneer of political poetry, who many consider an influential and inspirational veteran of the UK hip-hop scene. He is headlined to play alongside the likes of Ms Dynamite, the Doves, David Gray and this year’s Mobo award winner Estelle, at venues up and down the country in support of LMHR. At Glastonbury, Leftfield will have a tent dedicated to LMHR. The campaign uses music, produced and performed by diverse talents from all backgrounds, to bring people together in vibrant celebration of a multicultural and multiracial society. Skinny — who jokes that he knew he was thin when he found he could fit through the bars of his primary school gates – said: “It’s a privilege to be on stage manifesting my words and sounds with others who support the campaign. Together we can show that we are united against the evil that is racism. “It’s not a black or a white thing, it’s a council-estate of mind thing.â€? Skinnyman, who has an army of fans prepared to travel from all over Britain to hear him, is well positioned to use music — and his own particular brand of humour – as a cultural, social and political weapon. He talks scathingly about the activities of neo-Nazi organisations and has strong views on religion. Commentary of cocaine abuse and the crime-ridden estates he grew up in also feature heavily in his shows. “Ninety per cent of the world’s population is poor working class,â€? says Skinnyman, “yet our government spends more money on space missions and nuclear weapons than they do on us. There is no political representation for the poor people of Leeds or the rest of the world. We need our children to wake up with a conscious recognition of the true state we’re in – not which shops are having the latest discounts.â€? Skinny’s call for a revolution in Britain may seem extreme but his passion for the things he believes in cannot be denied. 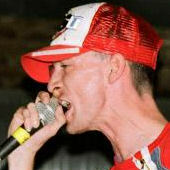 Skinnyman is performing in support of LMHR at Finsbury Park, London, on 6th June. For more information on LMHR and a full events listing visit www.lmhr.org.uk. He is back in Leeds at the Firefly on June 1 – with Busta Rymes’s DJ, DJ Scratch. Posted by Martin Crossley in Interviews. Just on your theme, the top 1% of the world own more than the bottom 90%. I’m a 21 yr old man from Southend and I’m constantly incredably frustrated by the shortsightedness of the opressed, especially the youth. Until we realise (and more importantly act upon this realisation) that the people in power are actively trying to preserve the status quo, by using age old tried and tested methods of confusion and deciption. I.E. the false creation of common enemies, the elevation of essentially minor issues- such as footaball, fashion etc so we, as a class and as a people, remain blinded….. if you have a minute read The Way of the Peaceful Warrior, by Dan Millman, and if the Gulag Archipelago by Aleksandr Solzhenitsyn (maybe the condensed version if you havn’t got endless hours. The theory and reality in both can just as easily be applied to our lives. It’s time to wake up and stand up. By the way, Welcome to the Itchy Side is the best tune i’ve heard for time. Safe.